A woman walked around with a sombrero, while some men wore fake gold chains. Patriots safety Duron Harmon was seen playing on a keyboard, while New England safety Patrick Chung weighed in on the latest NBA news surrounding Pelicans star Anthony Davis wanting a trade. "Hey man, look. AD, it's your decision, bro," he said. "You come here (to Boston), we'll love you. If you go somewhere else, it is what it is, brother. Just make sure you're happy." Fans sang "Happy Birthday" to Patriots kicker Stephen Gostkowski, who turned 35 on Monday. And the Rams cornerback who blatantly got away with pass interference -- helping Los Angeles reach the Super Bowl -- did his best to minimize bulletin board material he recently provided. This all can only mean one thing: Super Bowl week has arrived. It began Monday, with Opening Night at State Farm Arena in downtown Atlanta, where both the Los Angeles Rams and New England Patriots took center stage. "We call this part of the week story time," Rams cornerback Aqib Talib said. "Cameras, the microphones, everything is out. You'll answer the craziest questions that you've probably been asked in your life." The hyped event -- which once upon a time was just known as "Media Day" -- kicked off the weeklong festivities surrounding Super Bowl LIII in Atlanta. The game itself is Sunday at Mercedes-Benz Stadium, scheduled for 6:30 pm ET. This event marks the only time the two teams will be in the same location before the game. For the fourth consecutive year, coaches and players from both Super Bowl teams answered questions from the media in prime time. Fans who attended event were provided radios as they listened and watched the media interview members of the Rams and Patriots. Patriots running back James White: "It's pretty cool. A lot of media out here, the fans. We enjoy the whole experience. 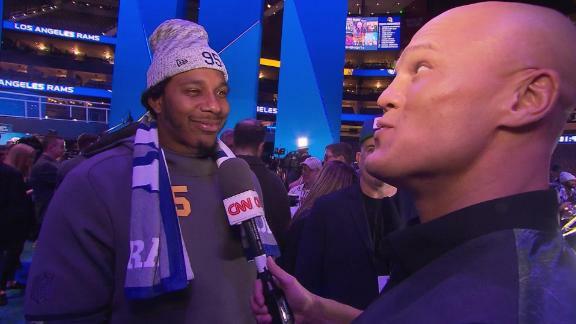 Some people think it's a big deal, but it's just trying to enjoy every moment of the Super Bowl experience." Rams offensive tackle Andrew Whitworth, who is in his 13th season: "It reminds you of how big this game is. It's an electrifying game that's the greatest in the world. It just really puts in perspective to you how important this game is to people and really what a great opportunity you have every week to represent the shield and the NFL." Rams running back Todd Gurley -- who played college football at the University of Georgia -- received one of the loudest cheers of the night from fans. His take: "It's super cool. It's like -- I don't even know. I can't really explain it, but it's pretty cool." Patriots wide receiver Julian Edelman: "It can be overwhelming. You've got a bunch of cameras in your face. ... We're all trying to have the mental capacity to get ready for the toughest game of the year. It's definitely real tough, but it's a good hour to get away and enjoy the experience." Rams wide receiver Brandin Cooks, who played for the Patriots last season, on returning for another Opening Night: "It's a blessing to be back here. It seems like time flies. It seems like I was here yesterday, but to be back here is awesome." One player in particular who had many cameras in his face was Rams cornerback Nickell Robey-Coleman, who benefited from the controversial no-call from officials on an incomplete pass to Saints wide receiver Tommylee Lewis in the NFC championship game. The New Orleans crowd wanted a flag for either pass interference or helmet-to-helmet contact on a defenseless receiver by Robey-Coleman. It wasn't thrown, and it's seen as one of the worst missed calls in playoff history. But Robey-Coleman made news again. In an interview with Bleacher Report, he was quoted as saying about Tom Brady: "Yes. Yes. Age has definitely taken a toll. Movement. Speed. Velocity. Arm strength. He still can sling it, but he's not slinging it as much. Whatever he was doing -- because of his age and all that -- he's not doing as much of that anymore. He's still doing the same things; he's just not doing as much of it. And sometimes, it's not the sharpest. But it still gets done." On Monday night, Robey-Coleman clarified those comments. "When I talked about Tom Brady, it was not to look down on his age," Robey-Coleman said. "They asked me a question as, what's the difference between Tom when I played him in Buffalo and Tom now, and I just said his age. His skills are still the same. His arm is still the same. Nothing has changed, and I want to address to everybody that I'm not talking about his age. It's nothing about his age. ... I was asked a question, and I really felt like it was taken out of context."